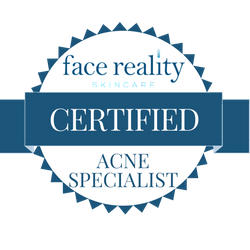 The Skin Studio performs professional acne treatments with professional grade skincare to get rid of acne faster than with products alone. We closely monitor your skin, making sure that we are “pushing” your skin to clear but not so much that your skin gets irritated. We are your partner in this process, working together so you can have clear skin as quickly as possible. The process consists of each client checking in every two weeks for a 3 month initial time frame, boosting their regimen without dryness or irritation. The key to success is diligence, communication, and dedication. • Lifestyle considerations that could be affecting your skin. SAY GOODBYE TO PROBLEMATIC SKIN TODAY! Includes comprehensive intake assessment, sensitivity test, and acne clinic guidelines. Includes a double exfoliation. First, with enzymes, second, with an acne peel. Recommended for stubborn acne, those with more than average extractions, and clients with long periods between treatments. • Assess what type of treatment your skin needs. • Assess how your home care regimen will be adjusted so that your skin does not over-adapt and stop responding.